1. 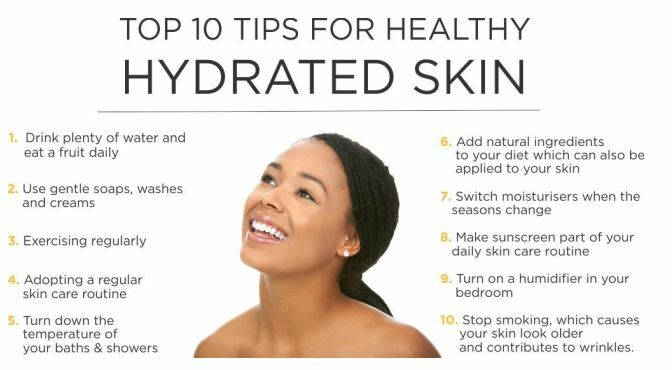 Drink plenty of water and eat a fruit daily, is the easiest way to hydrate your skin is to keep your body hydrated from the inside. It’s also good for your heart and your kidneys, so make sure you are getting your two liters of water a day. Most fruit has high water content and contains the vitamins and minerals that your skin needs to stay healthy. Replace one of your daily snacks with a fresh fruit. 2. Use gentle soaps, washes and creams: Check the labels on your soaps, washes and cleansers. Avoid the chemical laden, harsh soaps, which will strip the natural oils from your skin. 3. Exercising regularly, sweating is nature’s way of eliminating toxic chemicals that can build up under skin. Regular exercise maintains healthy circulation and blood flow throughout your body, including your skin. 4. Get into the habit of adopting a regular skin care routine, that consists of morning and evening washing, cleansing, moisturizing, combined with bi-weekly exfoliating and toning, will keep your skin clean and avoid oil build-up. 5. Turn down the temperature of your baths and showers, hot water will also strip the oils from your skin, so don’t spend too much time in hot showers or baths. 6. Adding natural ingredients to your diet which can also be applied to your skin. Olive oil contains fatty acids and antioxidants that will help keep your skin hydrated and healthy. Massaging olive oil into your skin, before you shower or bath, will help to stop the warm water and soap drying your skin out. Add avocado to your diet. It also makes for a natural hydrating face mask. Another good skin care product that is raw organic honey, that is naturally hydrating and it also has anti-bacterial and anti-fungal properties that will soothe irritation and fight infection. 7. Switch moisturisers when the seasons change. Your skin needs more moisture in winter than in summer. So the same day you bring those sweaters down for the winter, buy a heavier moisturizer. When you trade in the sweaters for shorts, switch to a lighter one. 8. Whether you’re up for a day in the sun or not, make sunscreen part of your daily skin care routine. 9. Turning on a humidifier in your bedroom will also help to stop your skin from drying out. Also, don’t have the central heating or the air conditioning on too high, as both these can dry out your skin. 10. Smoking makes your skin look older and contributes to wrinkles. Smoking depletes the skin of oxygen and nutrients that are important to healthy skin, it also damages collagen and elastin. A regular skin care routine combined with the correct skin care products in conjunction with a healthy lifestyle is vital for hydrated skin. Looking after your skin will delay aging and stay younger for longer, affect your mood and make you more confident. A regular skin care routine combined with the correct skin care products in conjunction with a healthy lifestyle is vital for hydrated skin. Looking after your skin will delay aging and stay younger for longer, affect your mood and make you more confident.